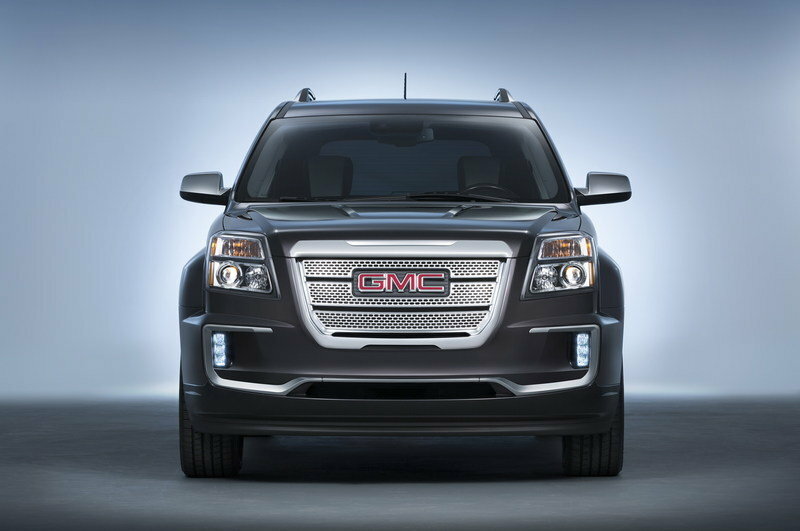 GMC has just announced a host of enhancements for its popular midsize crossover ahead of the 2015 New York Auto Show. 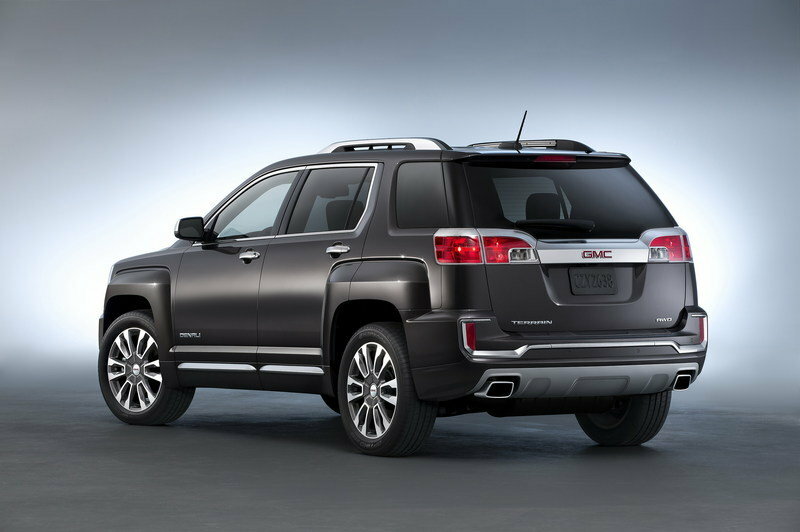 This mid-life refresh of the GMC Terrain consists of visual updates, both inside and out, that will hopefully breath new life into its sales. Not that its sales are slacking – GMC says the crossover had its best year ever in 2014, selling 105,016 units in total. 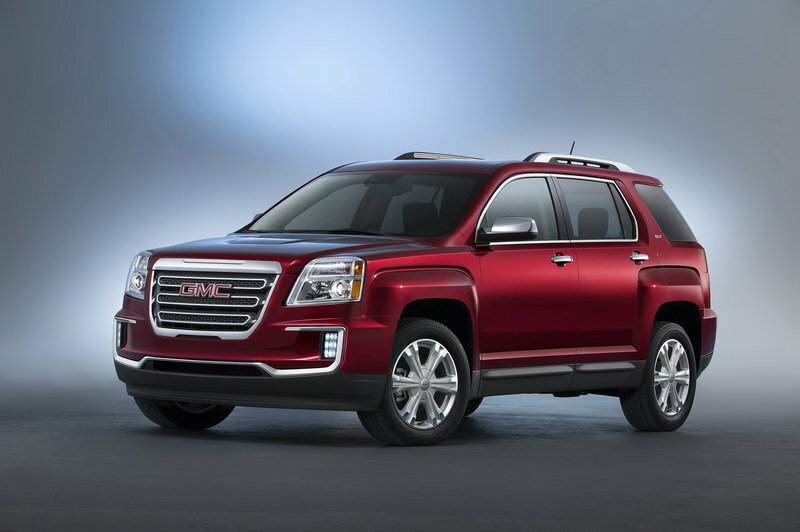 These visual updates span across the Terrain’s trim levels, including the popular Denali model. The model lineup now consists of the SL, SLE, SLT, and of course the Denali. The SLE grade further breaks down into SLE-1 and SLE-2 trim levels, giving customers more choices when it comes to grouping options together. 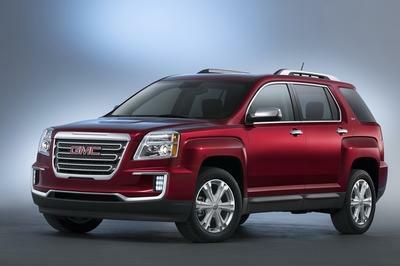 GMC is leaving well enough alone in regards to the Terrain’s powertrain. Two engine options and two drive-wheel options offer the span between a four-cylinder with FWD to a V-6 with AWD. Fuel economy is also expected to stay put, with the highest rating listed at 23 mpg city and 32 mpg highway. 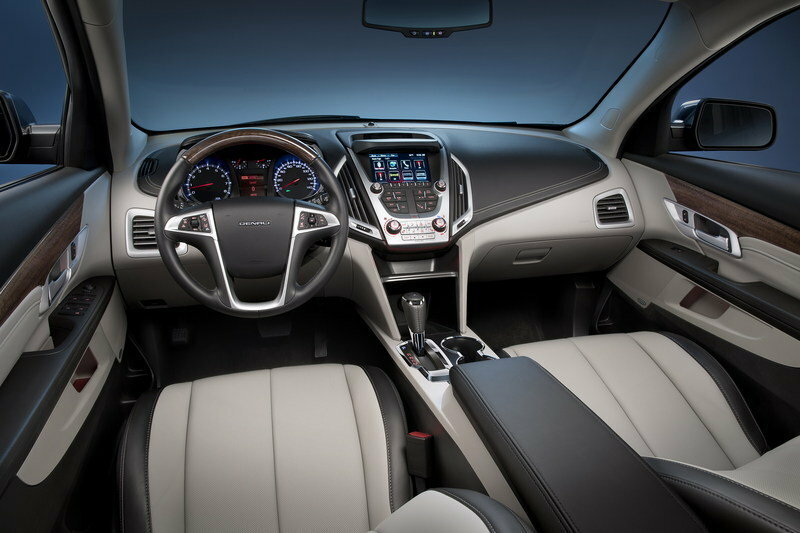 Continue reading to learn more about the 2016 GMC Terrain. Much of the changes for 2016 consist of exterior visual updates. The new front and rear ends help brighten the Terrain’s appearance while giving it a more upscale look. The front of non-Denali models get a three-bar chrome grille with the familiar black honeycomb backing. A new C-shaped chrome ring wraps around the new LED daytime running lights and connects in the center of the bumper. This brings more visual weight downward, making the crossover look more planted. That same C-shaped design makes its way rearward and surrounds red reflectors on the rear bumper. Chrome accents dress up the taillight area as well. 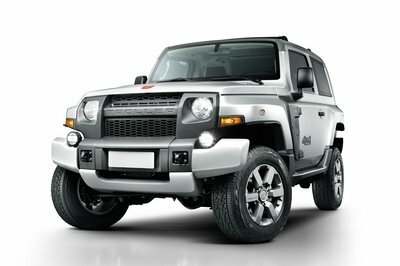 Terrain Denalis come with the same front fascia as non-Denali models, but get the standard Denali treatment of a much flasher chrome grille. 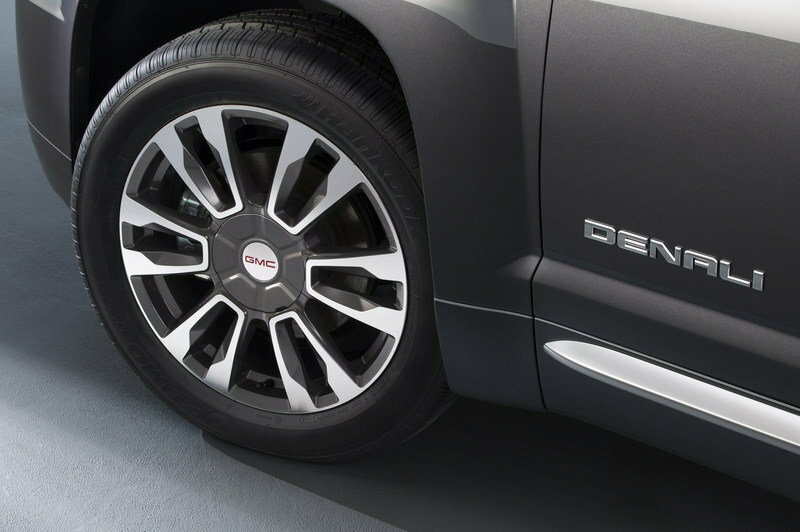 A new pair of 18- and 19-inch wheels finish off the updates, with the larger wheels belonging to the Denali. Lastly, two new color options are available: White Frost Tricoat and Crimson Red Tintcoat. Like the outside, much of the interior is refreshed. The casual observer might not recognize the changes, but the updates consist mostly of changes to the center stack. Revised hard buttons for the infotainment system are more intuitive than before. The door lock button is now moved from the dash to each door panel as well. Gone is the CD/DVD slot under the HVAC controls, replaced by a small shelf for storage. Down below, a revised shifter looks more upscale and include the manual shift buttons on its top rather than hanging off its side. Coverings for the seats are also new. Coming standard on SL and SLE trims is a new premium cloth fabric while upper trims get the option of a new “Saddle Up” leather color. Denali models get the option of a new Light Titanium and Jet Black color combination. Beyond looks, the Terrain gets upgrades with its safety systems. GMC now offers Side Blind Zone Alert and Rear Cross Traffic Alert on SLE and SLT models where it was only available on the Denali before. Also available with OnStar is GM’s popular 4G LTE Wi-Fi hotspot for mobile streaming. Things under the hood remain unchanged for 2016. 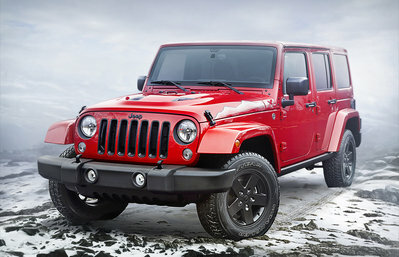 That leaves customers the option of the standard 2.4-liter four-cylinder or the optional 3.6-liter V-6. Both engines offer direct fuel injection and variable valve timing for added efficiency and power production. The 2.4-liter produces 182 horsepower and 172 pound-feet of torque while the V-6 offers a respectable 301 horsepower and 272 pound-feet of torque. Both engines come mated to the six-speed automatic transmission. Regardless of engine choice, customers can opt for either the standard FWD or optional AWD. Terrains with AWD send power to the front wheels the majority of the time unless traction becomes an issue. At that time, power is diverted rearward for added grip. 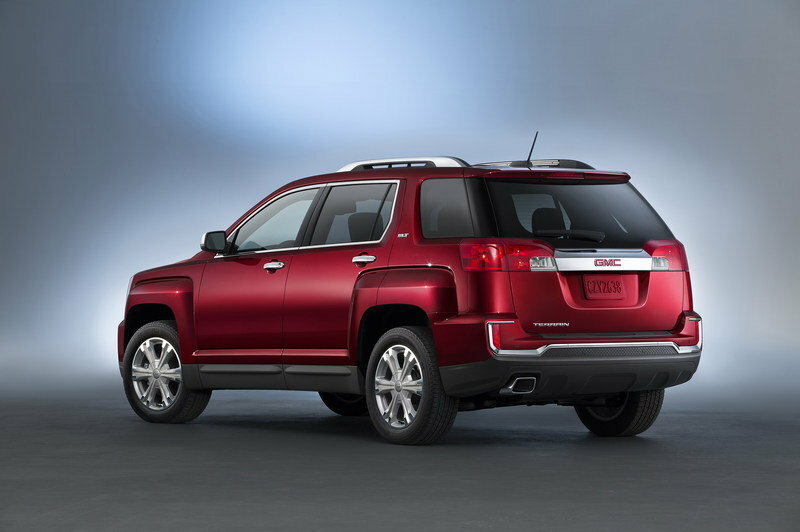 GMC has yet to announce pricing for the 2016 Terrain, but count its MSRP to stick around its current listing. For 2015, prices start at $24,995 and range northward to $38,186 for an AWD Denali. The CR-V is one year into its own mid-cycle refresh, having been reworked in 2015, so its looks are still very fresh. 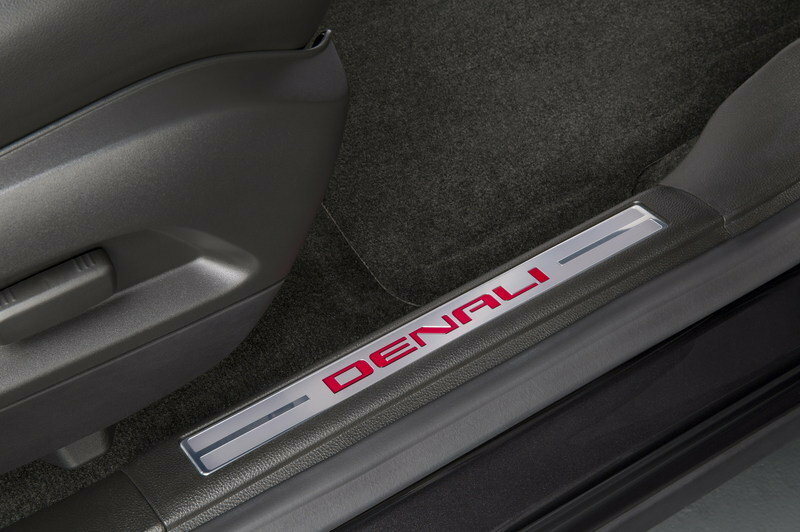 The Honda isn’t quite the luxury offering the Denali is, but it matches up well with the Terrain’s lower trim options. A spacious cabin offers fantastic fit and finish while two rows of seating offer roughly the same room as the GMC. 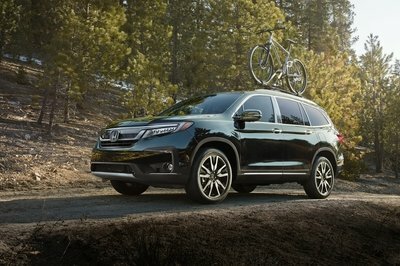 Unlike the Terrain, the CR-V only offers one engine choice – a 2.4-liter four-cylinder with 185 horsepower and 181 pound-feet of torque, though AWD is available. If you’re looking for a hot rod, you’d better stick with the GMC. 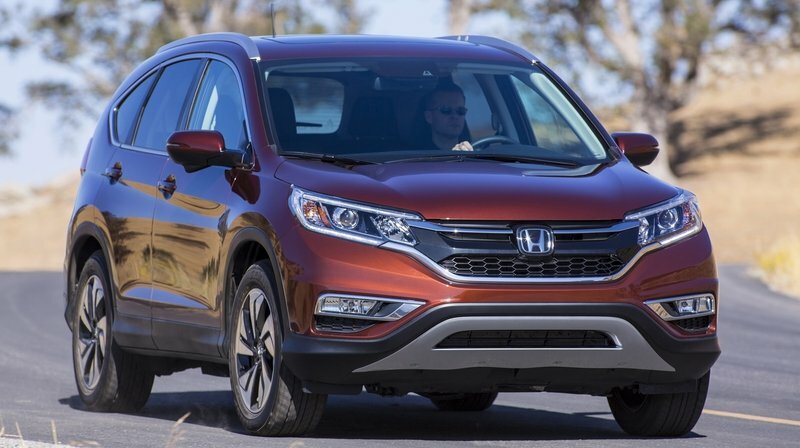 Conversely, the CR-V’s prices start at $23,320 and rise into the low $30,000 range. Perhaps 185 horsepower doesn’t sound so bad after all. 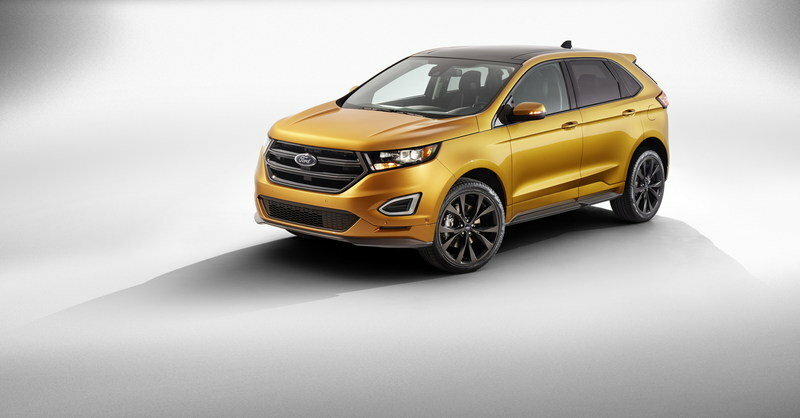 2015 is also a critical year for the Ford Edge as it’s completely new from the ground up. Sportier, more daring looks cover all sides of the Edge, with chiseled corners and angular accents. Things inside are also very modern with two-tone leather seats and an infotainment system by Microsoft. Where GMC and Honda rely on naturally aspirated engines, Ford takes the turbocharged route, offering both the 2.0-liter EcoBoost I-4 and the 2.7-liter EcoBoost V-6. 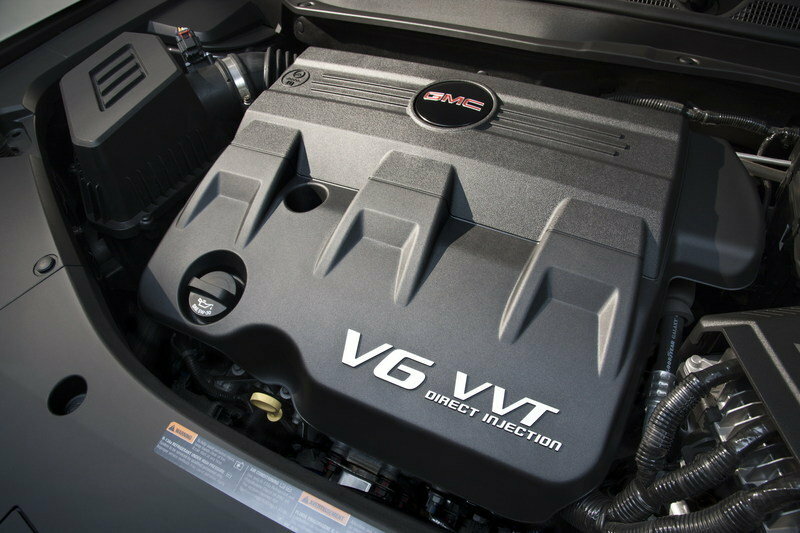 The base engine, however, is still the naturally aspirated 3.5-liter V-6. Prices are more in line with the GMC, starting at $28,100 and rising into the upper $30,000 range. 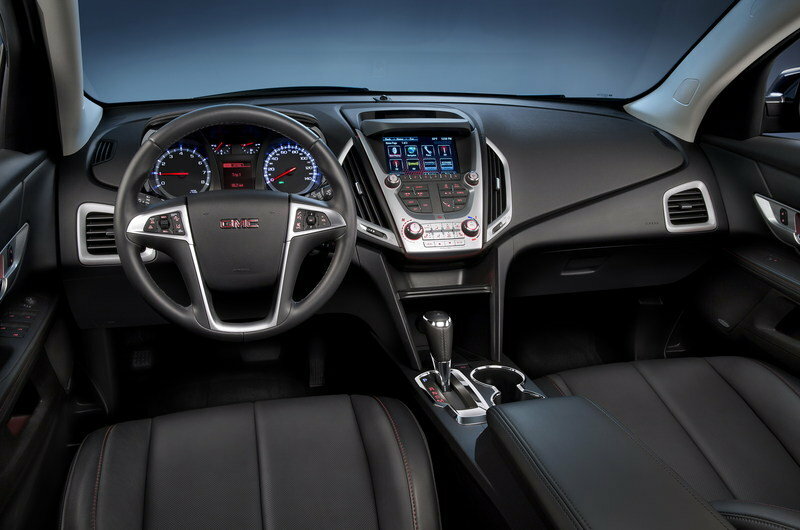 This mid-cycle refresh for the GMC Terrain helps broaden its appeal by adding more upscale looks and interior color options. The slight revisions on the dashboard are noticeable, but only to those familiar with the current design. Still the updates are welcomed. 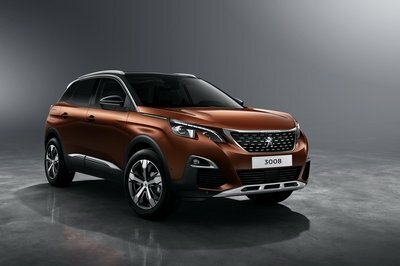 Though no changes are made with its powertrain, the Terrain offers two solid engine options and two drive-wheel options. For those folks looking for a entry-level luxury sedan substitute, the GMC Terrain Denali offers a decent choice. Seating for five, room for stuff with the rear seats folded, two-tone leather upholstery, an intuitive infotainment system, and chrome galore help bring the Escalade’s style to a less expensive (and smaller) GM vehicle. 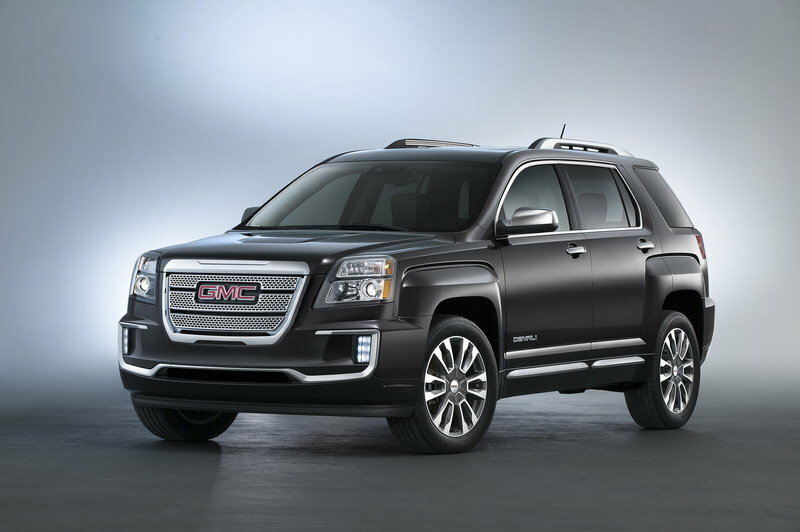 Distinguished by a new, more contemporary front-end appearance, the 2016 GMC Terrain and Terrain Denali were introduced today, ahead of their public debut at the New York International Auto Show.